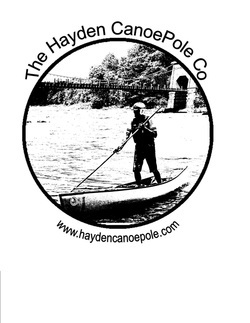 Welcome to the Hayden Canoepole Company. Our company was founded in the early 1990's by Ed Hayden (see above image) whose goal was to develop and supply quality canoepoles for those engaging in the exhilarating sport of canoe poling. Canoe Poling is an American Canoe Association recognized competitive sport. Canoe Poling races are scheduled throughout the spring each year, culminating with regional championships and a National Competition in June. Recreational Poling is enjoyable as long as there is open water. For the joys of being on the river and moving both upstream and downstream in water depths and flows which are not easily paddleable, Poling is unsurpassed. And standing tall in your canoe gives an angle of sight into the water that reveals more clearly what is beneath the surface. After nearly two decades, we continue to build and supply quality canoepoles and repair parts. You will also find links ( www.canoepoling.org) to schedules for enjoyable downriver cruises and coaching clinics as well as competitions and Poling photos. Other links (www.millbrookboats.com) will take you to sites for lightweight boats designed by Ed Hayden specifically for the sport of canoe poling. All in all, we strive to bring to you the equipment and information you need to stand tall on the water and enjoy the bounty of your region's rivers and streams.